The purpose of Ensemble is to enable you to develop, configure, deploy, and manage Ensemble productions. An Ensemble production integrates multiple, disparate software systems. A production includes elements that communicate with these external systems, as well as elements that perform processing that is internal to the production. Business services accept requests from entities outside the production and relay them to host classes inside Ensemble for processing and fulfillment. Business processes accept requests from host classes within the production  business services or business processes  and either process the requests or relay them to other host classes inside Ensemble for processing. 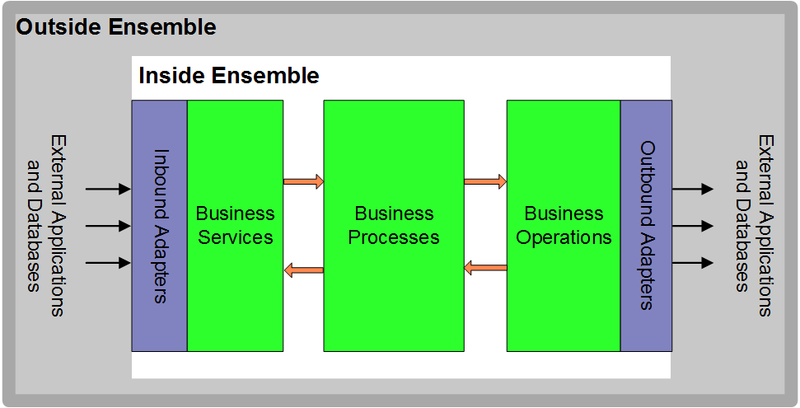 Business operations accept requests from host classes inside Ensemble  business services or business processes  and either process the requests or relay them to entities outside Ensemble for processing. Business hosts communicate with each other via Ensemble messages. 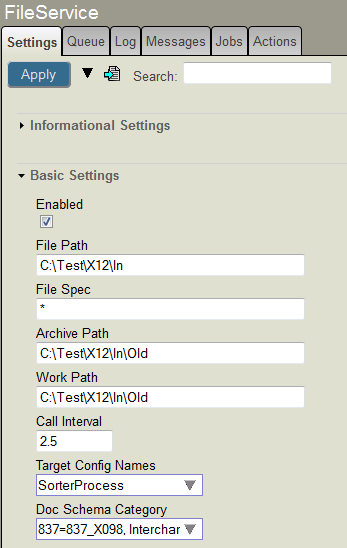 All Ensemble messages are stored in the Ensemble message warehouse and can be seen via the Management Portal. In most cases (but not all), a business service has an associated inbound adapter. The role of an inbound adapter is to accept input from entities external to the production. Similarly, a business operation usually has an associated outbound adapter. The role of an outbound adapter is to send output to entities external to the production. Ensemble provides a large set of adapters to handle different technologies. For example, you use a different adapter for files than you do for FTP. It is also possible to define your own adapters. The production and its business hosts have settings provided by Ensemble; they correspond to properties of the production and business host classes. You can define additional settings in exactly the same way, by defining your own subclasses of Ensemble classes. You can also remove settings so that the corresponding properties are hardcoded and not configurable. An inbound adapter receives an incoming event, transforms it into an Ensemble message object, and passes it to its associated business service. The business service creates a follow-on request message, and passes this new message to a business process or business operation within Ensemble. A business operation encapsulates the capabilities of a resource outside Ensemble, usually an external software application. The business operation transforms properties of the Ensemble request message object into a format usable by the external application API. An outbound adapter manages the details of communicating with a specific external system or application from within Ensemble. It transmits the API call to the external entity. The processing can also include workflow, which makes it possible to incorporate human interaction into automated business processes. Uses of workflow within the enterprise might include order entry, order fulfillment, contract approval, or help desk activities. The chapter Other Ensemble Options provides more information. Ensemble is built on top of Caché  that is, an Ensemble installation contains a complete installation of Caché. Caché is a full-featured database system; it includes all the features needed for running mission-critical applications (including journaling, backup and recovery, and system administration tools). To help reduce operating costs, Caché is designed to require significantly less database administration than other database products. For Ensemble, the Management Portal includes all the options that are present in a Caché installation, as well as additional menus that are specific to Ensemble. Ensemble uses the security tools provided in Caché. Caché provides a complete security model that includes authentication, authorization, auditing, and database encryption. Additional tools provide secure communications to and from external entities. Caché (and therefore Ensemble) also provides several built-in, general-purpose programming languages that can be used to create class definitions and routines. This means that Ensemble productions can provide highly customized behavior. For an introduction to Caché, see Introduction to Caché. In the event of a planned or unplanned shutdown, Ensemble provides a high degree of recoverability. That is, when the system is restarted, it can resume execution with little to no interruption in service. The degree of recovery depends on several factors: the robustness of the external applications; implementation details of the various business services, business processes, and business operations, and the nature of the outage itself. State information related to long-running business processes, which may take days or weeks to complete. That is, stopping and starting a production does not interfere with this processing. All this data is persistent across system outages. Typically, you purge data at periodic intervals, as described in Managing Ensemble.